Once the suspender for men is a substitute for the belt, it is a practical single product in men's dress. It's very suitable for suspender because men's trousers mostly flat waist. A wild and comfortable strap provides you with a comfortable sense of security, no tighten the feeling of the stomach, you'll feel the thrill of the liberation of the body. 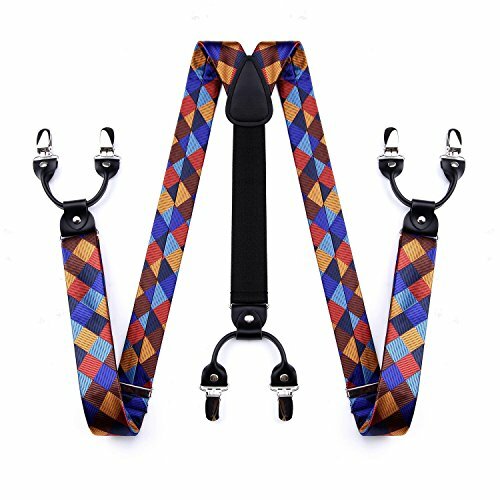 6 metal clasps and high end PU leather these suspenders share weight more efficiently over your body and enhance balance while wearing. Suitable for most occasions: weddings, formal events, photo sessions, costumes and special events. Size: suspenders width is 1.38", length adjustable and the back part is elastic,total length Up to 50". Suspender with 6 STRONG CLIPS - Our suspenders' clips made of high quality strong metal, not easy to rust, not easy to fall off and not easy deformation. If for any reason you are unhappy with any product by us, please do not hesitate to contact us. We take full ownership and responsibility for the quality of our products and will do our very best to solve your problem quickly and efficiently!